If you feel that a particular designer is not upto the mark or is unable to provide you the designs that you are looking for, in such cases, you can either eliminate the designs that you don't like or simply eliminate the designer all together. Thus, preventing the designer from submitting any further designs in your contest. 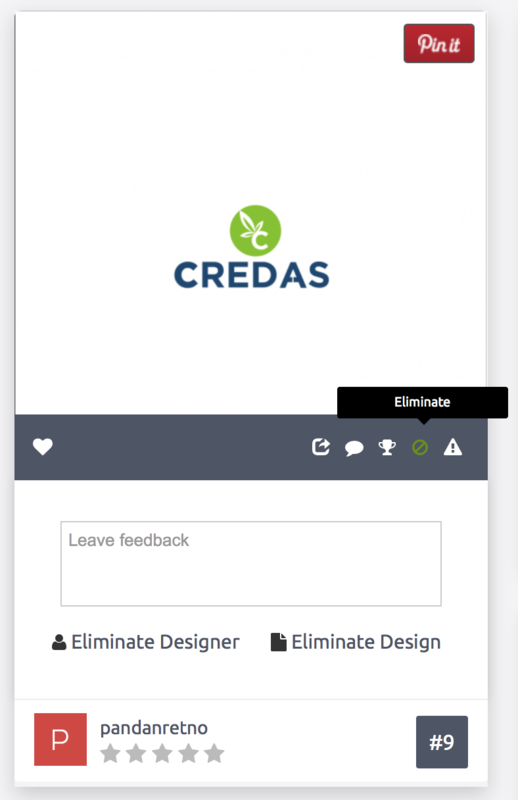 To eliminate a designer, on your 'Entries' tab click on the eliminate icon on any one of the designs of the designer you want to eliminate and select the 'Eliminate designer' option. Pro Tip: If you have eliminated a designer by accident, you can reinstate them by clicking ‘Un-eliminate designer’ which will have replaced the ‘Eliminate designer’ option in the same place where you eliminated the designer. Keep in mind that an eliminated designer can no longer submit entries.